Simple Weather Widget is simply the best weather widget in the App Store. 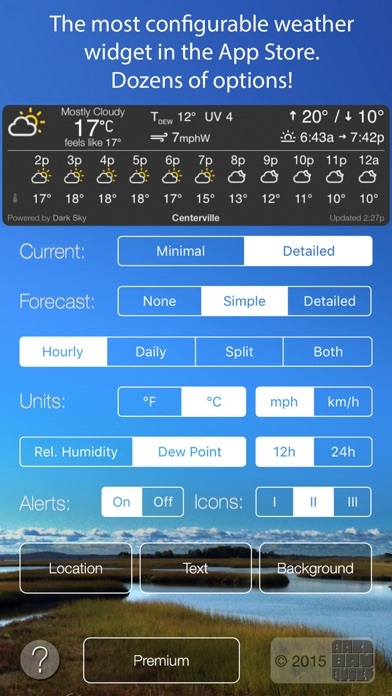 It provides a highly customizable, very compact, beautifully designed widget in the "Today" view on your iPhone, iPod Touch or iPad, which displays the current weather (and, optionally, a forecast) for your location. 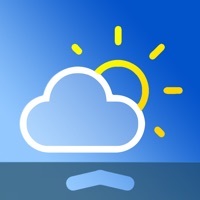 Finally a weather widget with NO WASTED SPACE on your Today screen! A simple, clean, compact design with lots of options so you see as much or as little information as you want. Available information: Current Weather: - Temperature - Clouds/Precipitation - Relative humidity or dew point - Today's high/low temperatures - Wind speed and direction - Sunrise/sunset time - Severe weather alerts (premium users only) - "Feels like" temperature (premium users only) - UV Index (premium users only) Forecast: - Temperature (hourly & daily high/low) - Clouds/Precipitation - Precipitation likelihood (hourly & daily) (premium users only) - Wind speed (hourly) (premium users only) As much or as little as you'd like of all that information, and it only takes up a tiny bit of your Today View screen space. You can also change the colors, select from three icon styles, or add a background image. The free version features high quality weather data for your area from OpenWeatherMap. With a "Premium" upgrade, the widget can access more detailed data ("feels like" temperature, UV index, forecasted precipitation likelihood etc.) powered by the Dark Sky weather data service (it's a paid service, which is why the Premium option costs a bit more). There's also an economical "Plus" option that simply removes the "free version" message and updates the forecast more frequently. 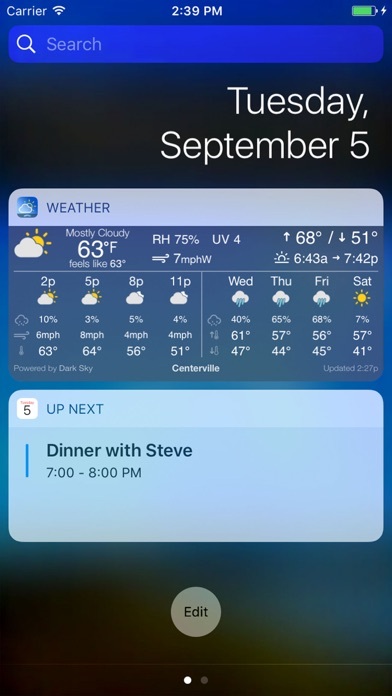 To add the widget to your Today view, once you've installed the app, just swipe down from the top of the screen, select the "Today" tab, and then find the "Edit" button at the bottom of the page. Under "Do Not Include", you'll find an item called "Weather" with the app's icon. Tap the little green (+) button next to it, and you're all set! The mOst inaccurate forecast app in App Store. I purchased your widget several months ago. It is a great widget: nicely designed and easy to configure. Unfortunately it is problematic in its only function. For example, last Saturday It forecasted rain for my home town through to the end of the following week. However, AcuWeather showed a more sunny forecast as did the local Weather Service. So I think you need to look into receiving your weather data from a more reliable source. Additionally, the email listed on your website bounced my mails. I used to love this widget, but ever since I upgraded to iOS 10, I repeatedly get errors when the widget refreshes. I have to double tap it a few times in order for the update to appear, which takes much longer now because of this issue. The app is beautiful and intuitive. Easy to use. However the weather info is completely wrong. It's easily off by at 10 degrees. It'll also say it's raining when it's full sun and vice versa. Bottom line, this is not a weather app but a beautiful widget. Will not work without tracking your location. Why do they need your location? Wouldn't a simple ZIP Code be enough. Fix your app and stay out of my business! I use my ipad always in landscape mode. it is easier for me to do my work. Best weather widget I've seen. Tons of options and it doesn't take up too much space on screen. Love it! 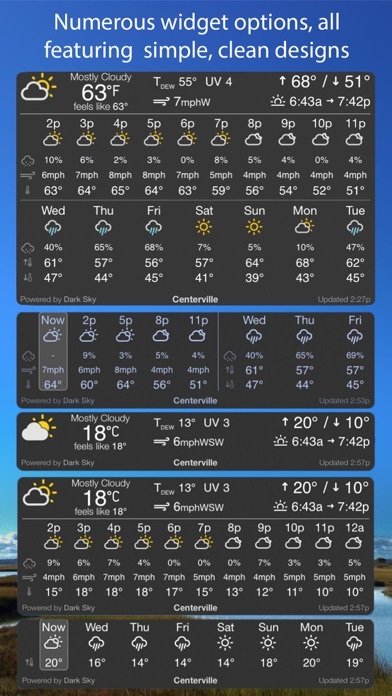 I loved this widget when it first came out, it packed a lot of info and options in a small space, but IAP creep and wildly inaccurate forecast data have made me abandon this for BeWeather and its widget.